Apple Music has been steadily growing over the past few years, and giving Spotify more competition along the way. Now, a new report from The Wall Street Journal says that Apple has overtaken Spotify in paid US subscribers for the first time. 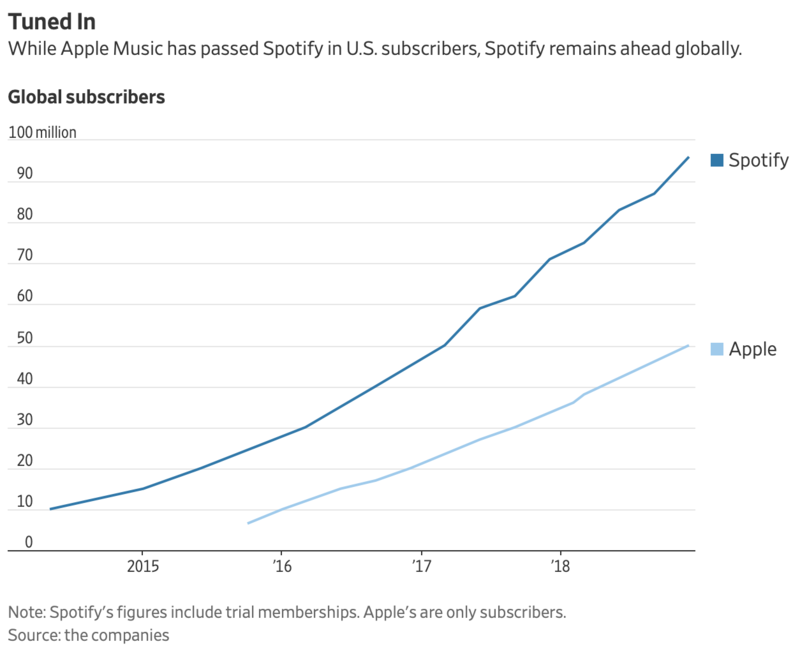 Notably, neither company shares detailed subscription numbers by region, but WSJ says that its sources close to the matter have confirmed that Apple Music’s US paid subscribers have surpassed Spotify’s. As of the end of February, Apple Music reportedly had 28 million paid US subscribers, while Spotify was 2 million behind with 26 million. Notably, Apple Music’s growth rate greater than Spotify’s. Apple Inc.’s streaming-music service has been adding subscribers in the world’s biggest music market more rapidly than its Swedish rival—a monthly growth rate of about 2.6% to 3%, compared with 1.5% to 2% for Spotify—the people said. When looking at Spotify’s non-paid accounts, the service does still have more US users than Apple Music. However, those Spotify accounts don’t generate much revenue for the company. Spotify still has a sizable lead when it comes to overall users compared to Apple Music, but its numbers (shown below) include trails while Apple’s don’t. However, Apple Music appears to be profitable and sustainable, while Spotify’s average revenue per user is declining as the service grows. Back in January we learned during Apple’s earnings call that Apple Music had 50 million paid subscribers globally. We’ll likely get another official update on the streaming service’s growth during the company’s Q2 earnings call scheduled for April 30. In another effort to grow the streaming service globally, we learned this morning that Apple Music undercut Spotify and YouTube premium in India. Other recent moves that will encourage Apple Music growth include Amazon’s Fire TV gaining support for users in the UK with Echo functionality coming soon, while HomePod saw a $50 price drop yesterday. Spotify is a music streaming service that debuted in late 2008. It's the most popular music streaming service in the world with over 200 million users (as of January 2019).